The urge to look cute as you in-line skate around is perfectly understandable -- but as with most types of outdoor recreation, function always trumps style. You'll be most comfortable on your skates when you wear non-cotton, wicking clothing that offers plenty of freedom of movement, and you should always wear protective gear in case of a fall. In-line skating involves plenty of motion in both your upper and lower body, so wear clothing that lets you swing your arms and move your legs freely. You should be able to bend forward from the waist without fear of flashing anybody. Once you have fit covered, consider materials: Cotton may be tempting in hot weather, but it'll get soaked with sweat and turn clammy once you slow down; if there's any sort of breeze, you could become very chilled. Go for non-cotton wicking layers instead, because they'll dry faster. It may be tempting to skip the protective gear -- but even experts can take a tumble if a loose dog or small child runs in front of you. Wear a bike helmet and wrist guards to protect your wrists if you fall forward onto your hands. 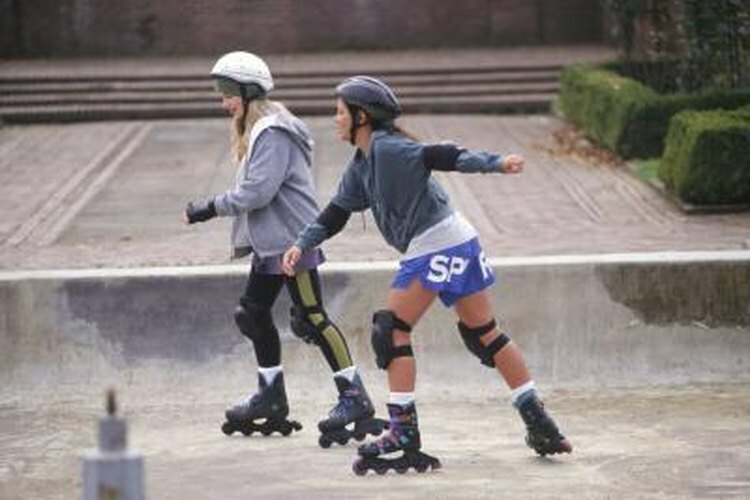 You should also wear hard-shelled kneepads and elbow pads for extra protection, especially if you're a beginner.